Today, we spent most of the day in the old city of Jerusalem, and in some important Christian sites. We began at the Western Wall, where faithful Jews come to pray; it is the only area of the Jerusalem Temple still standing, and faithful Jews pray there, nearest where the Holy of Holies once stood in the temple. Then we went through some tunnels once used for the conveyance of water, seeing some remarkably old architecture. We crossed the Kidron Valley to visit Gethsemane, where Jesus prayed to be released from the cup of suffering, and where he was ultimately betrayed by Judas. We visited the church which stands where Jesus would have been tried and beaten by Caiaphas, including a dungeon in which Jesus may have been housed for his flogging. We then walked the Via Dolorosa, tracing the steps where Jesus carried his cross toward Golgotha, and the Church of the Holy Sepulchre. The rock where Jesus was crucified remains exposed within this church, and the tomb in which he was buried can be seen from within the same church complex. Many go to visit the rock of Calvary and the tomb, though, of course, Jesus is not there. Where he did appear, the Upper Room, was another place we visited. The Upper Room was turned into a Christian synagogue not long after the resurrection (probably after the destruction of the temple in AD 70). We know it was a Christian synagogue because it was shaped like a synagogue, and instead of being oriented toward the temple, it was oriented toward the Church of the Holy Sepulchre, the site where the crucifixion took place! After the conquering of Jerusalem by the Muslims, it became a mosque, and now is largely guarded by the Israeli ministry of religion as a tourist site. It was quite moving to sing God’s praise in the very room where Jesus and his friends had their final Passover meal together, and where the Holy Spirit descended on the first believers; the birthplace of Jesus was Bethlehem, and the birthplace of the church is the Upper Room! It was a busy day, and we were glad to get on the bus to travel back to the hotel after what I’d call the longest 7 km walk of my life. But it was a very special walk indeed. Yesterday, we began our day with a visit to the Bible Lands Museum, including the Shrine of the Book. This place boasts a 1:50 scale model of the old city in the time of the second temple, and is very impressive (though, alas, a bit too big to add to my HO [1:87] scale railway empire). The Shrine of the Book holds several of the fragments of the Dead Sea Scrolls on permanent display, as well as the scroll of Isaiah, which was preserved in its entirety. Many of the scrolls which were fragmented were cut up by the Romans when they overtook the Essene communities at Qumran; the Isaiah scroll was not found by them, so it survived intact. Later, we went to the Old City and explored some ancient aqueducts, watercourses prepared in Canaanite and Davidic times as well as in the time of Hezekiah. Their versions of sewer and water mains built the foundation for what allows us fresh water intake and adequate drainage of waste today. At the Bible Lands Museum, we saw two sections of a water “pipe”, cut out of stone. These were shaped square stone sections that fit together, with a groove on one end and a flange on the other. Remarkable engineering for thousands of years ago! We stood by the site of the pool of Siloam, where the blind man washed the mud Jesus put over his eyes, so he could see. We came up from there to the base of the Western Wall of the temple. The size of the stones cut to build that place were as remarkable as Josephus said they were! To stand on the remnants of the temple steps, where Jesus himself stood to teach, was a moving moment. Those steps were cut in such a way that you could never run up them; each step had to be purposeful. I think this was done by design, to make the ascent to the temple a prayerful act. From there, we said good-bye to our tour guide for the rest of the day, and carried on into Palestinian territory, into Bethlehem. We stopped at the Nissan family shop, a souvenir shop specializing in hand-carved olive wood objects, while we waited for our Palestinian tour guide to take us to the Church of the Nativity. This visit was quite interesting, as we were able to see some ancient art in the building, and visit the grotto where many believe Jesus was born (directly on the spot). It was under this building, in a cave, where Jerome translated the Bible from Hebrew and Greek into Latin. Another long, but immensely interesting day! Yesterday, we left the serene shores of the Sea of Galilee and headed south. (Actually, those shores were not all that serene; there was a wicked wind storm going on, despite the clear skies, and had we had our boat ride on the lake that day, it would have been cancelled.) The night before had not been kind to me; multiple power outages left me awake at 3:00 a.m., unable to return to sleep. Our journey south led us to Judea, via territory that is owned by Israel but largely occupied by Palestinian people. We passed through a ‘check point’, and while it looked like a border crossing in some respects, all we had to do was slow down; people coming out, on the other hand, were being interrogated. This is a very complicated land, politically. We stopped first at the site where Jesus was baptized by John the Baptist in the River Jordan. At this point in the river, flowing south from the Sea of Galilee, it is actually quite deep. I don’t think that’s always the case, but it really depends on the rainfall. There was a marker on the wall above the water where, in January of this year, the water crested – and it was probably fifteen feet higher than it was as we witnessed it. The Orthodox, especially, consider this a holy site and have church buildings erected nearby – both in Israel and in Jordan, which is directly on the other side of the river. On both sides, structures have been erected to allow for pilgrims to be baptized (or, often, baptized again) in the very place where John baptized Jesus. Our leader pointed out a set of stone stairs on the Jordanian side which were put in place as early as the 300s, marking this spot as a pilgrimage site from the very early years of the church. It was interesting that at this Christian religious site, both Israeli and Jordanian soldiers were present, with the Jordanian soldier being more obvious, right down near the water, automatic rifle in hand. These two nations seem to get along well right now, but this unique place along the border is perhaps the weakest spot in terms of the simple ability to gain entrance from one direction or the other. One could walk through the water from one side to the other without being carted off by the current without great difficulty – as long as one wasn’t afraid to face the barrel of a gun upon ascent. From there we continued south through more Palestinian settlements – a lot of vegetable growing happens in this area, thanks to irrigation – and stopped at the caves of Qumran. When that Bedouin shepherd threw a rock into a cave back in 1947, he expected to hear a bleat, not a crack. What he discovered were clay jars filled with scrolls and fragments which contained almost the entire Old Testament, along with a number of other significant historical writings. These were stored there for safe-keeping by the Essene community, a sect of zealous Jews that died out in the early years of the last millennium. What those scrolls did for biblical scholarship was nothing short of amazing, proving that the faithfulness of scribes and God in the maintenance of the integrity of biblical documents was greater than any had imagined. Following this historically and religiously significant stop, we visited that most unique of tourist sites, the Dead Sea. The mineral content of the Dead Sea is such that it can house no life, and the water’s ‘heaviness’ enables anyone – even me! – to float effortlessly. The shore has such a coating of salt on it that it looks like a thin, sugary icing. But just being near the water and licking your lips assures you that it is decidedly not sugary. The mineral content of this water is such that if you don’t shower off when you get out, you’ll regret it until you do! Folks with a variety of skin ailments find the waters of the Dead Sea quite soothing. While there’s nothing especially faith-filled about a trip to the Dead Sea, it is one of those unique opportunities that ought not to be missed if one is travelling in Israel. Continuing south, through the Judean desert, we came upon a large rock overlooking the Dead Sea: Masada. It was here that Herod had a great palace. Jewish zealots overtook the community, and when the Romans went to retake it – building a ramp that was a feat of engineering for its day – the occupiers decided to kill their own rather than be taken back into slavery. A few women and children survived to tell the story, recorded in the writings of Josephus. Masada remains today as a symbol of Jewish nationhood and pride, despite its history. Our tour guide gave a very impassioned testimony of how he sees Masada as an Israeli. Tired from a long day, we made our way up to Jerusalem, through a traffic jam – in the middle of the Judean desert! – and arrived at our hotel for the night. I remarked to myself that hearing the whine of the bus engine as we climbed our way into the Holy City gave me a fresh appreciation for the Psalms of Ascent. People really did have to climb a long way to get to Jerusalem! Today, we travelled all the way to the top of Israel, to its borders with Syria and Lebanon, getting a great view of Mount Hermon. Some 3000 metres above sea level, it is the highest point in the area and is a significant landmark. Our tour leader remarked that it was the first time he had seen Mount Hermon without snow on it. Along the way, we began our day with a boat ride on the Sea of Galilee. Because every journey seems to have a soundtrack, the ship’s captain played praise music for us while we sailed. For a few moments, however, we stopped the boat, silenced the engine and the music, read Scripture and took in the sights around us. Within such a short distance, we could see several sites that involved significant moments in Jesus’ life and ministry: the place where he named Peter “Rocky”, the synagogue and Peter’s mother-in-law’s house at Capernaum; the place where Jesus performed the miracle of feeding the five thousand. It is moving, to say the least, to walk where Jesus walked. Travelling up the Golan Heights, our tour guide told us about the political aspects of the acquisition of this land, and how Syria left it filled with land mines. In several places, viticulture has taken over, and the mines have been replaced with vines! However, there is still a very obvious military presence there. The United Nations has a base quite near the border. We visited Caesarea Philippi, where Jesus challenged his disciples – amid the pagan temples – to identify the Son of Man. 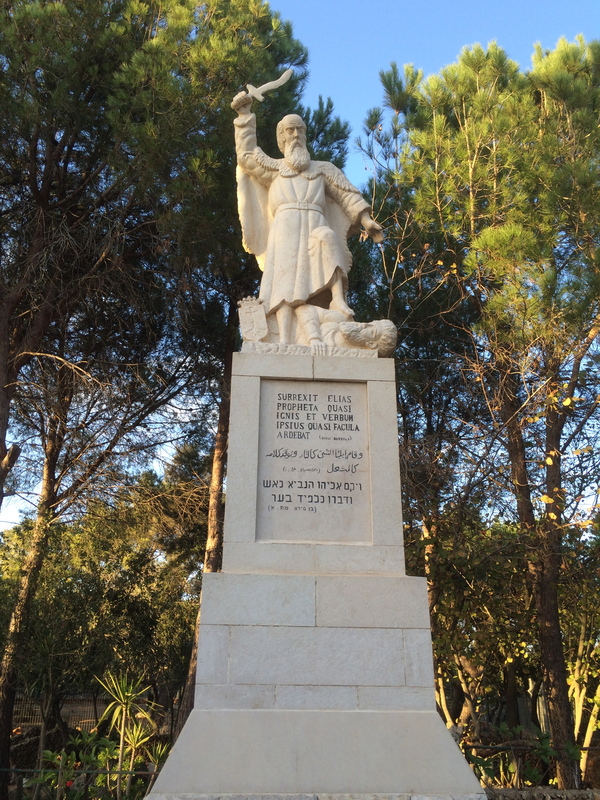 Flowing by, sourced by the melting snows of Hermon, was the beginning of the Jordan River. “How good and pleasant it is,” wrote the Psalmist, “when kindred live together in unity! It is like precious oil poured on the head, running down on the bear, running down on Aaron’s beard, down upon the collar of his robes. It is as if the dew of Hermon were falling on Mount Zion. For there the Lord bestows his blessing, even life forevermore” (Psalm 133). The Dew of Hermon, via the Jordan, eventually flows south toward Jerusalem! After Caesarea Philippi, we went to Dan, and saw two ancient gates, including the so-called Abraham gate, which is over 4000 years old. Four Thousand Years! And it’s only in the past 15 years that this has been discovered. When Abraham accepted God’s call to come to the promised land, he will have walked past that gate. Unbelievable. But oh, so real. Real: that’s what a trip like this does for the Bible. It makes it real. That’s what it’s doing for me. From there we visited Meggido, a strategic battle site in the history of this land, and one which John was probably envisioning when he depicted the battle of Armageddon in the book of the Revelation. From the top of this hill, you can see a long way; we walked uphill a long way, too! And we descended all 183 stairs to an ancient aqueduct that ensured the fort was not cut off from needful fresh water. Then, we climbed another 80 stairs to get back to ground level. A pretty fair workout for us all. From Megiddo we went on to Nazareth. What we picture in our mind’s eye as a little hick village in the middle of nowhere is now a bustling city of some 75,000 inhabitants, virtually all Arabic in race; there are some Christians – perhaps 20 percent, but almost everyone else is Muslim. We visited the first-century depiction of Nazareth Village, a project begun by the YMCA that is now its own foundation. The folks who put this on are not kitschy about it at all, but there is a sense of authenticity about this ‘museum’. We then visited the Mount of the Beatitudes, where pilgrims remember the time Jesus spoke the Beatitudes, recorded in Matthew 5. We have no way of knowing if it was the actual place where he spoke the words, but it is a place where that is remembered. From there, we watched the sun set over the Sea of Galilee. Tonight, we are staying at a kibbutz on the south shore of the lake. A serene place indeed! After a slightly bumpy but otherwise uneventful flight, we had a safe landing at Ben Gurion Airport in Tel Aviv. People started clapping as the wheels touched down, and I was thinking, Don’t clap yet! We’re travelling down the runway at 200 miles an hour! Clap when the plane stops…on purpose! I discovered that even with 120 volts to plug in my CPAP machine, I can’t sleep sitting up in confined quarters (and Air Canada’s seats are not exactly roomy). As a result, I’ll be running on fumes for the rest of today. It was fascinating to see so many Orthodox Rabbis rising to pray toward Jerusalem at various times, especially as the sun rose (which, when you’re flying eastward, catches up with you quickly!). It prepared us, I think, for what we will see. We won’t know, though, until our fellow traveller who has been detained is released so we can get on the bus and get going! Grateful for God’s grace and travelling mercies.